Distractions and interruptions are big time wasters especially if you work from home on a computer. Did you know that it takes approximately between 10 to 20 minutes from when you were first distracted to get back to what you were doing? What if you get interrupted all the time? You end up getting nothing done. Nowadays, the internet has become one of the major sources of information. But unless you control the amount of time you put in, it can also be a big source of interruption. We don't even realize how much time we squander. Other common time wasters vary from the phone, text messaging, the tv, Skype, chatting and IM to family and friends. If you keep on allowing time wasters to drain the bulk of your day, you'll keep on living in survival mode forever. You have to start taking control of time wasters and not constantly feel you're being carried away by them all. Our objective here is to maximize the limited time we make available, to work on our home business - in chunks of uninterrupted time as much as possible. Follow the tips below and notice how you can 'kind of organize' your time-wasters. Some may seem obvious but occasionally we need reminders to make us conscious and take the necessary action to improve our performance. Switch off your phone. Or at least set it on vibrate only. Leave Skype in offline mode and turn it on only when you need to make a call. Before calling, know what the aim of the call is. Then, keep it short and straight to the point. Turn off any pop-up that lets you know you have new incoming mail. Sign out of your e-mail browser whilst working. Check your inbox once, maximum twice a day but definitely not first thing in the morning. That's when you're at your optimal and as such, you should put your focus on the important stuff. Allocate a pre-defined amount of time to read and reply to e-mails, say 30 - 45 minutes. You may use your phone as a timer. As soon as you read an e-mail for the first time, take action immediately - either reply or delete it. Reduce the bulk of your incoming e-mails by unsubscribing from mailing lists irrelevant to your business - it only takes a couple of minutes but saves you heaps of junk. If you like social networking, such as Facebook or MSN, keep your chatting/instant messaging to off. Just like e-mails, plan a time bracket during which you allow yourself to check on friends' activities. Fail to do this and you end up draining all your available time on listening to music clips, watching you tube videos, commenting to gossip and updating your status - huge time wasters. If you're addicted to Facebook, give permission to yourself that you don't have or need to keep up with all the constant updates. Lots of people starting out a business often complain of information overload. There is a lot of good quality free information on the net that you end up downloading every single webinar, tutorial and pdf file on offer. At first, it's not easy to filter the chaff from the grain. One simple tactic to help you reduce the load is to ALWAYS know exactly at which stage you're at in your business. Are you brand new? are you creating your own products? are you putting your marketing in place? Let's take an example. You're new to the online business and want to start out by selling other people's stuff. You need training specifically on affiliate marketing. You don't immediately need tutorials on say, how to be a speaker, on the presumption that you might need it in the future. Learn on what you're working now, in the moment. That way, whenever you come across what seems like 'a can't refuse one time limited offer' you'll immediately know whether it applies to you or not. Always know where you stand and learn how to say NO. Plus, never buy on impulse. Sidenote - The volume of your e-mails can ridiculously increase during the launch of a new product, when, over a span of few days, you may receive the same free training videos from different marketers, all promoting the same item. Don't get overexcited by all the hype during product launches. This is the trickiest of them all. I split these into two categories - kids and other family members plus friends. As a mom, family comes first. That doesn't mean you always have to be available at everyone's first whim. The mess in the house seems to be never ending, especially with young kids. Striking a balance between the daily necessary tasks and building your business is not easy. Talk to the children. Explain that mommy needs to work. We tend to undermine how much they understand and how co-operative they can be if made aware of the situation. They feel involved. It took me some repetition but eventually it sunk in. Reward any good deeds they do whilst you're working. I was amazed by the feedback. My 7 year old son on his own will, suggested that he does chores around the house so I can work more! He also pulled his 6 year old sister in the deal! Locate an area at home where you use it exclusively to work on your business. A tranquil spot where you can work comfortably. No need to start with a big home office, simply an area where there is no other clutter except your business related stuff, easily accessible to you. Set up boundaries for this area - no toys, no food or drink, it's everyone's except your do not touch area. Target to work for at least two hours a day. 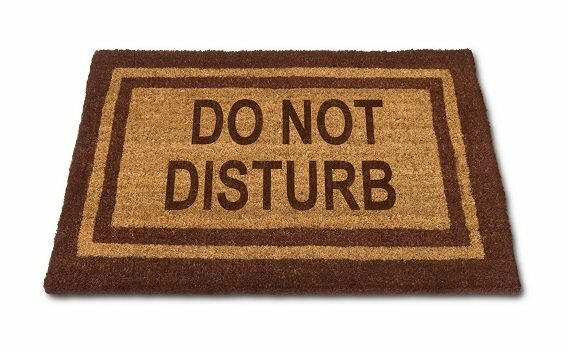 That will be your do not disturb time - you may need support from your partner/spouse on this. The other culprit - surprise visits from family, friends and neighbours. Some folks don't really understand that you're actually working, when you're on your computer. They don't take us seriously that we work from home and feel that it's ok for them to stop by at any time of day. One of the most irritating comments I used to get was 'you're always fooling around on your computer'. Speak to them and make it crystal clear not to pass by unannounced. Be firm and explain that you are infact working. May sound a bit of a shock at first but they will understand, eventually. A few may get irritated. However, they must appreciate that you are killing two birds with one stone by working at home and from home. Would they do the same if you worked in an office outside of your residence? Step 1 - Get a blank sheet of paper and write down all the nuisances that disrupt you. This is your first step to help you become aware of all the background noise you currently live in - this list can be long but don't let it intimidate you. Step 2 - Sort the items in priority order, the one that bothers you the most on top and continue with the rest of the listed items. Step 3 - Put a plan in place to start eliminating one by one until you gradually wipe out all your time wasters. Don't try to get rid of them all at once. If for instance, the tv is your No. 1 time waster, switch it off immediately and get used to this new habit before moving on to tackle another bugger on your list. Otherwise it becomes overwhelming and your new regime won't stick. Unless you start making changes, as small as they may seem, you're going to stay stuck where you presently are. So go on. Start taking action now and get rid of your time wasters once and for all.